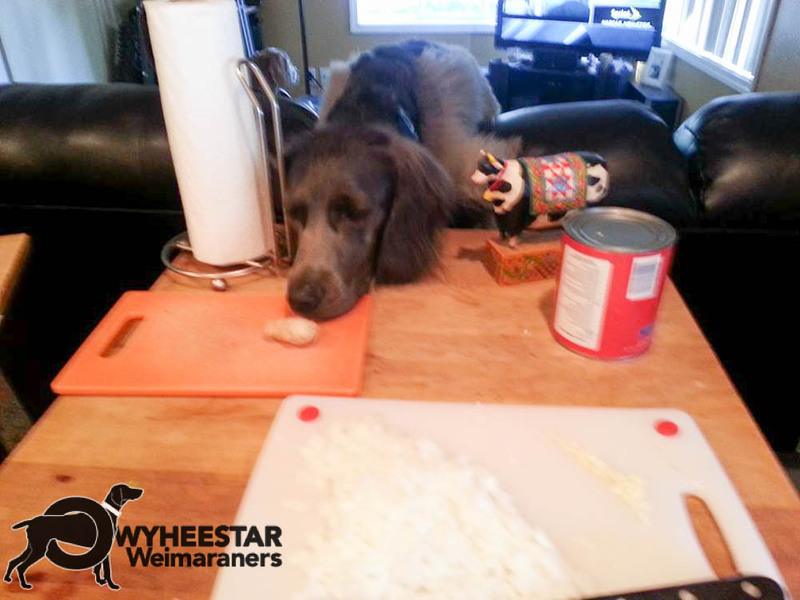 ~ just because you eat it doesn't mean it is safe for the Weimaraner! Alcohol – I’m sure you’ve heard of the birthday parties where the dog accidentally gets into some of the spilled keg beer, and then gets all silly to the amusement of the crowd. While it may be funny to you, it’s not funny to your dog. Alcohol can cause not only intoxication, lack of coordination, poor breathing, and abnormal acidity, but potentially even coma and/or death.Avocado – Avocados contain Persin, which can cause diarrhea, vomiting, and heart congestion. Baby food – Baby food by itself isn’t terrible, just make sure it doesn’t contain any onion powder. Baby food also doesn’t contain all the nutrients a dog relies on for a healthy, well maintained diet. Cooked Bones – When it comes to bones, the danger is that cooked bones can easily splinter when chewed by your dog. Raw (uncooked) bones, however, are appropriate and good for both your dog’s nutritional and teeth. Candy and chewing gum – Not only does candy contain sugar, but it often contains Xylitol, which can lead to the over-release of insulin, kidney failure, and worse. Chocolate – You’ve probably heard this before, but chocolate is a definite no no for your pup. And it’s not just about caffeine, which is enough to harm your dog by itself, but theobromine and theophylline, which can be toxic, cause panting, vomiting, and diarrhea, and damage your dog’s heart and nervous systems. Coffee – Not sure why you would give your dog coffee, but pretty much the same applies here as to chocolate. This is essentially poison for your dog if ingested. Corn on the cob– This is a sure way to get your dog’s intestine blocked. The corn is digested, but the cob gets lodged in the small intestine, and if it’s not removed surgically, can prove fatal to your dog. Additionally, too much corn kernels can upset the digestive tract as well so be cautious to not feed too much. Hops – An ingredient in beer that can be toxic to your dog. The consumption of hops by your dog can cause panting, an increased heart rate, fever, seizures, and even death. Human vitamins – Some human vitamins are okay to use, but the key is comparing the ingredients (all of them – active and inactive) to the vitamins your vet subscribes for your dog (often you can get the human equivalent for much less money). Make sure there’s no iron – iron can damage the digestive system lining, and prove poisonous for the liver and kidneys. Marijuana – Not that you would pass the bong to your dog, but if you do, you should know that it can adversely affect your pup’s nervous system and heart rate, and induce vomiting. Milk and dairy products – While small doses aren’t going to kill your dog, you could get some smelly farts and some nasty cases of diarrhea. Why? Dogs are lactose intolerant (as are an increasing number of humans today), and don’t have enough of the lactase enzyme to properly digest dairy foods. If you really need to give them dairy, look into lactose-free dairy products. Mushrooms – Just as the wrong mushroom can be fatal to humans, the same applies to dogs. Don’t mess with them. Onions and chives – No matter what form they’re in (dry, raw, cooked, powder, within other foods), onions are some of the absolute worst foods you could possibly give your pup (it’s poisonous for dogs, and its even worse for cats). They contain disulfides and sulfoxides (thiosulphate), both of which can cause anemia and damage red blood cells. Persimmons, peaches, and plums – If you live in an area that is home to persimmon, peach, or plum trees, look out. Persimmon seeds and peach and plum pits can cause intestinal obstruction and enteritis. You’ll want to make sure there aren’t any wild persimmon or other fruit trees that produce seeds growing in your backyard. If you notice your dog pooping all over the place, and see a bunch of seeds or pits in their waste, you’ll need to break out the saw and chop down some trees. Rhubarb, and tomato leaves – These contain oxalates, which can adversely affect the digestive, nervous, and urinary systems. Raw fish – Another vitamin B (Thiamine) deficiency can result from the regular consumption of raw fish. Loss of appetite will be common, followed by seizures, and in rare instances, death. Salt – Just like salt isn’t the healthiest thing for humans, it’s even less healthy for dogs. Too much of it can lead to an imbalance in electrolyte levels, dehydration and potentially diarrhea. String – While not a food itself, foods can often contain or be similar to string (ie. meat you’ve wrapped for the oven). If your dog were to eat a string, it could get stuck in their digestive tract and cause complications. Sugar – This applies to any food containing sugar. Make sure you check the ingredient label for human foods – corn syrup (which is a less expensive form of sugar or glucose) is found in just about everything these days. Too much sugar for your pup can lead to dental issues, obesity, and even diabetes. Tobacco – A major toxic hazard for dogs (and humans). The effects nicotine has on dogs are far worse than on humans. Nicotine can damage your pup’s digestive and nervous systems, increase their heart rate, make them pass out, and ultimately result in death. Xylitol – A sugar alcohol found in gum, candies, baked goods, and other sugar-substituted items, Xylitol, while causing no apparent harm to humans, is extremely toxic to dogs. Even small amounts can cause low blood sugar, seizures, liver failure, even death for your pup. 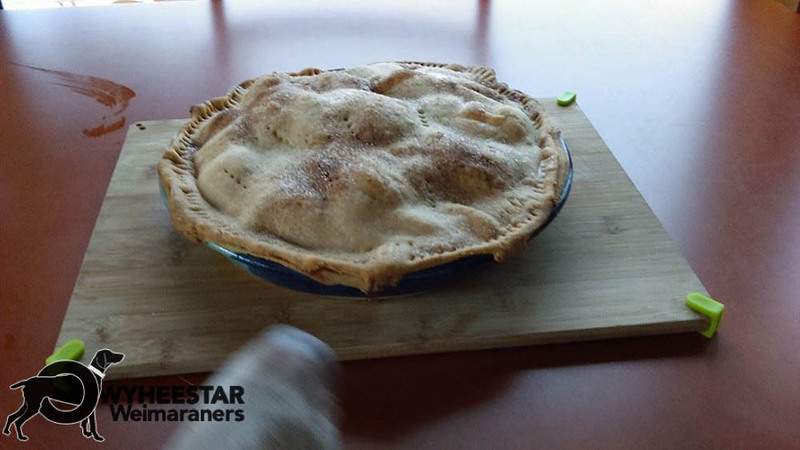 Yeast (on its own or in dough) – Just like yeast rises in bread, it will also expand and rise within your pup’s tummy. Make sure they don’t get any. While mild cases will cause gas, lots of farting, and discomfort – too much of it could rupture their stomach and intestines. The last thing we want is a trip to the emergency room (albeit for a human, or the Weimaraner). This is never truer than on a holiday. Unfortunately, we can easily become distracted for a moment, or miss what is happening. Here are some things to keep in mind during our celebration. Counter-surfing — it takes a moment when your back is turned, and they have it. Trash-raiding — make sure it is Weimaraner safe. Ingested cooked turkey bones, foil, string, and a myriad of other items can lead to emergency surgery. Skip the bones entirely — you might want to treat them, but things can go awry. Table scraps need to be carefully monitored. With guests sneaking them a morsel here and there, it can easily get out of control. These rich additions can upset their tummy, or trigger a more serious condition. For example, the turkey skin might seem harmless, but the fatty morsel (or too much rich food in general) could trigger a pancreatic attack. Weims can have a sensitive tummy in general; however, the important thing is to remember a dog cannot handle all this rich holiday food (or the trimmings). The best approach would be to set a dish of allowed scraps, and tell people they must not have any more than what is on the plate. This may not prevent the well-meaning guest from giving them what they should not get. Ingested roll dough stories abound on the Internet. Yes, it does pose a danger. Cake, and yeasty bread batter when ingested, expands rapidly in the dog’s gut. The dangers are not limited to what we plan to eat. Remember the risk includes candles, cut flowers, alcohol, potpourri, etc. Finally, do not forget about things like sugarless gum, candy, etc. The Weimaraner is opportunistic, and they can find a jelly bean at the bottom of someone’s handbag.